The Willbrook Plantation Golf Course is nestled between two area plantations in Pawleys Island, South Carolina. Acclaimed by the famous architect Dan Maples, Willbrook’s design is “one of his best’! Receiving rave reviews by popular golf magazines as “Top 50 for Women” and “The 100 Greatest Holes along the Grand Strand”, this is a course to play. Love Nature? Play Willbrook Plantation and experience golf backdropped with an enormous oak forest. Golf with precision, Willbrook is where nature and strategic gameplay meet. The course is so beautiful that it was televised on an episode of “Nature Scene” for its dual functions. Favored by women golfers, Willbrook is a 72 par course with superb greens and new hybrid champion Bermuda grass. Golfers meet challenges head on at the 15th hole. Play through winding century old oaks, ponds, creeks, trees, and sand bunkers. The course runs 6,722 yards and has a slope of 131. Golf Digest gives Willbrook Plantation a 4.5 star rating and ranks among one of the best golf resorts that women enjoy playing. Additionally, Willbrook received a USGA course rating of 72.5. Both ratings make Willbrook a top course to play among beach golf courses. Willbrook‘s immaculate grounds, challenging golf, and helpful staff are key ingredients for the course’s success. After your round is over visit the clubhouse. Golf discounts on apparel and select equipment is found at the pro shop. Golfers hankering for a meal and cold beverages can relax at the club’s restaurant and lounge. Looking to improve your short game? The facility features an area for short game practice, which includes sand bunkers. A driving range and putting green is also located at the impressive practice facility. Vacation golf packages are available and include additional golf courses in Myrtle Beach. Golf packages provide ease of playing a variety of Myrtle Beach golf courses, affordable accommodations at top notch golf resorts or hotels, and discounted tee times. Book your tee time now for Willbrook and golf in Myrtle Beach! 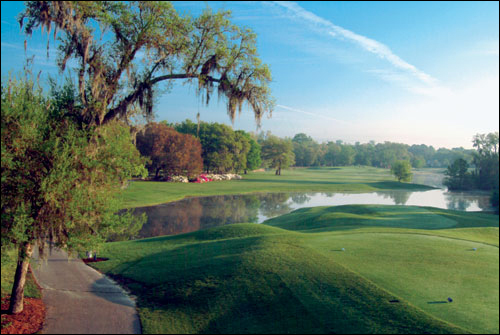 The Willbrook Plantation Golf Course is nestled between two area plantations in Pawleys Island, South Carolina.